Nasir Lassiter is a college basketball star with a promising future–until a murder rap lands him in prison with a life sentence. Nasir would love to right the wrongs his absence has brought the women in his life. And when his daughter is kidnapped, he will risk everything to save her–even if it means putting his newfound freedom on the line. 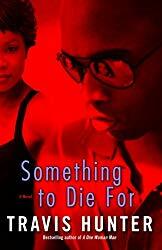 A riveting novel of love, loss, and reconciliation, Something to Die For follows the twisted path of a man desperately fighting for the good life he deserves–and for the family who needs him now more than ever.